Cars are going to undergo a lot of changes in the coming years. One of the biggest: You probably won’t own one. Thanks to ride sharing and the looming introduction of self-driving vehicles, the entire model of car ownership is being upended—and very soon may not look anything like it has for the past century. Drivers, for instance, may no longer be drivers, relying instead on hailing a driverless car on demand, and if they do decide to buy, they will likely share the vehicle—by renting it out to other people when it isn’t in use. Auto makers, meanwhile, already are looking for ways to sustain their business as fewer people make a long-term commitment to a car. And startups will spring up to develop services that this new ownership model demands—perhaps even create whole new industries around self-driving cars and ride sharing. Here’s a look at the changes to come, and what they mean. Car ownership, for a long time, has symbolized freedom and independence. But in the future, it may be akin to owning a horse today—a rare luxury. Ride sharing as we know it will grow in popularity as people get even more comfortable with the sharing economy, and more people migrate to dense cities where owning a car is a burden. One-quarter of miles driven in the U.S. may be through shared, self-driving vehicles by 2030, according to an estimate by Boston Consulting Group. And the business of ride sharing may take on some new forms. Startups such as Los Angeles-based Faraday Future envision selling subscriptions to a vehicle—for instance, allowing people to use it for a certain number of hours a day, on a regular schedule for a fixed price. So, people who need a vehicle for a few hours daily to attend meetings or make deliveries could subscribe and avoid having to summon on-demand rides every day (and potentially paying a lot more). Other companies are experimenting with the idea of allowing drivers to access more than just one kind of vehicle through a subscription—so, a driver might choose a compact model one day but a minivan another day if she needed more passenger space. “By 2022, 2023, the majority of transportation in urban cities with temperate weather will be on demand, shared and likely autonomous,” says Aarjav Trivedi, chief executive of Ridecell, a San Francisco company that provides the back-end software for car sharing. Even people who do end up buying a car may come to see it as a short-term arrangement—and a source of income. Chief Executive Elon Musk has hinted that he’s preparing to create a network of Tesla owners that could rent out their self-driving cars to make money. Already, some drivers are testing this idea using other services that let them market their cars, something like Airbnb rentals on wheels. Take Jeff Cohen, who works for an electric-vehicle-charging company. His wife balked at his desire to buy the Model S sedan, which Tesla Inc. typically sells for about $100,000. Turo, which had more than three million people sign up for the service through the end of May, says Teslas, along with BMW and Mercedes-Benz cars are among the more popular searched vehicles on the site. “A lot of people are realizing that the car is no longer just a cost—it’s an asset,” says Andre Haddad, Turo’s chief executive. Of course, the biggest obstacle to many of the changes may be the most simple: People have to be willing to give up the idea of owning their car—something that has been culturally ingrained over many decades. What’s more, under this vision, car buyers won’t just give up the idea of sole ownership. They may also give up the idea of sitting behind the wheel by using autonomous vehicles. They will have a powerful incentive to do so. A study by Deloitte Consulting, for example, estimates that the cost of personal car ownership is on average 97 cents a mile today but could drop by two-thirds in a world of shared, self-driving vehicles—a tipping point that could usher the technology into daily life for many people. In cities, the idea will be even more appealing, because it takes away the unpleasant sides of ownership, such as parking and negotiating traffic jams. Companies are already looking at how to market vehicles to overcome some of the possible psychological resistance to nonownership. 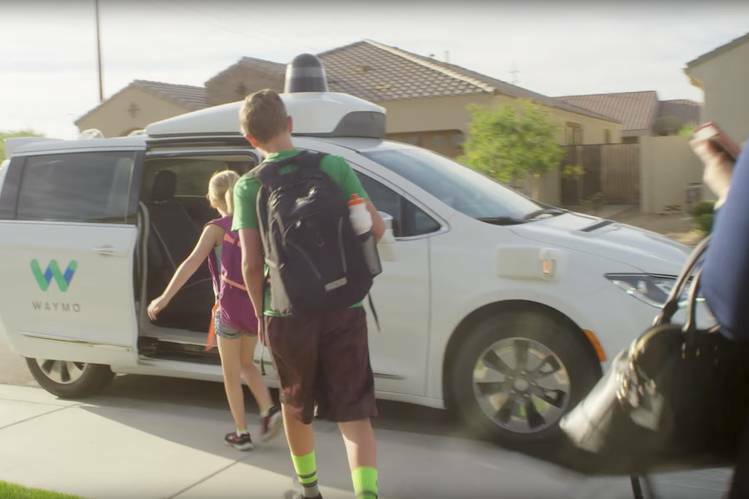 Waymo, the self-driving tech unit of Google parent Alphabet Inc., has begun public trials of self-driving minivans in Phoenix for select users, with the eventual goal of testing them with hundreds of families. The goal is a better understanding how to make such a service appealing enough to take the place of a family car. “We’re really experimenting here with how far our users can go in terms of using a service like this one to replace their own personal transportation,” says John Krafcik, head of Waymo and a former automotive-industry executive. For auto giants, the new ownership models—whether for traditional cars or self-driving ones—constitute a major threat. As a result of both driverless cars and fleets of robot taxis, sales of conventionally purchased automobiles may likely drop. What’s more, because autonomous cars will likely be designed to be on the road longer with easily upgradable or replaceable parts, the results could be devastating to auto makers that have built businesses around two-car households buying new vehicles regularly. Currently, cars get replaced every 60 months on average, according to Experian. In response, some car companies are trying to meet that threat head-on, by experimenting with different ownership models. One plan to get drivers to buy a vehicle of their own is to help owners rent out their vehicles, as they would in Mr. Musk’s planned network of Tesla owners. Toyota’s Lexus brand is testing payment plans that let people subsidize the purchase of pricey cars by renting them through a service called Getaround. 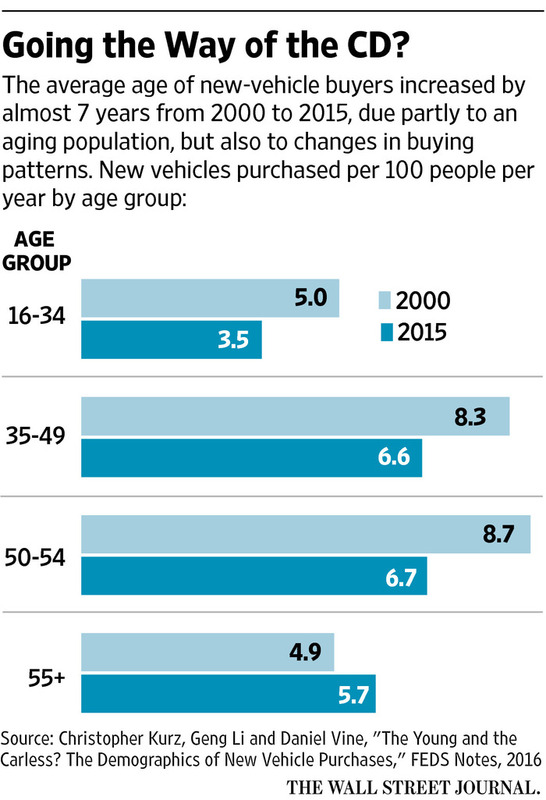 The hope is that young buyers, who have been eschewing traditional ownership but are still attracted to luxury nameplates, will grab the chance to afford fancy cars on Corolla budgets. 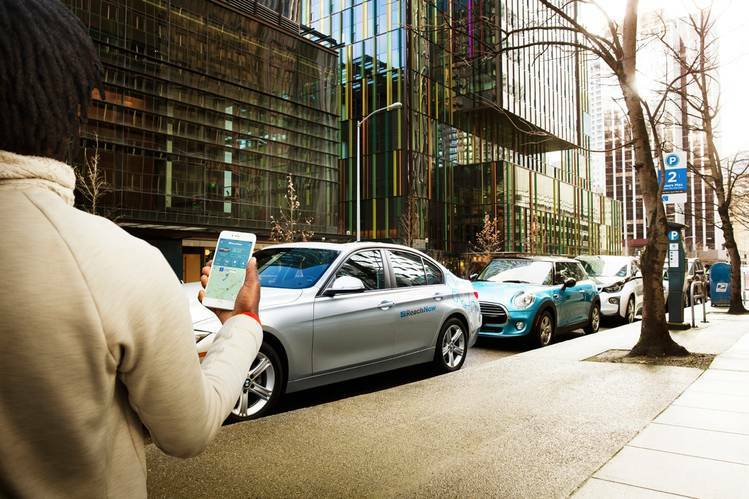 BMW , meanwhile, is experimenting with shared rides through its Reachnow service. Members can get access to a fleet of BMW vehicles—and Minis, in some areas—that they pick up as needed and can drop off anywhere when they’re done. General Motors Co. , the largest U.S. auto maker by sales, seems to be hedging all bets. The company acquired an autonomous-car tech startup called Cruise Automation last year in a deal with a potential value of more than $1 billion. It also invested $500 million in ride-share company Lyft, as well as starting a car-sharing service of its own called Maven. Meanwhile, it’s offering Cadillac customers the ability to subscribe to ownership, letting them use a vehicle for a month at a flat fee. The advent of self-driving cars will give people more free time while in the vehicle. And that will create new opportunities for car makers and others to make money. Autonomous vehicles could ultimately free up more than 250 million hours of consumers’ commuting time a year, unlocking a new so-called passenger economy, according to Intel Corp. , which is trying to provide the computing power behind self-driving software. The chip maker released a study in June that estimates as much as $800 billion could be generated by 2035 by this passenger economy, while as much as $7 trillion could be in play by 2050. All of which might explain why new entrants to transportation, such as Apple Inc., Amazon.com Inc. and Samsung Electronics Co. , are exploring the field. Apple in April, for example, became licensed to test-drive autonomous vehicles on California roadways. This could lead to a turn away from using the exterior of the vehicle as a selling point and focusing on making the interior as comfortable and loaded with features as possible. In some cases, that means turning cars into living rooms on wheels: Harman International Industries Inc., the auto-parts supplier acquired by Samsung for $8 billion, demonstrated in Las Vegas earlier this year a vision of a car that replaces a vehicle’s windows with video screens that create a wraparound movie theater inside the cabin. Design firms will also cook up features designed to ease people into the practice of sharing rides regularly. IDEO, the design firm that came up with Apple’s first computer mouse, has released a vision of autonomous vehicles designed to accommodate strangers who end up riding together. One central feature is “pods”—seats that can be adjusted to block a passenger from the view of the others—and there are areas in the vehicle that allow them to lock items while other people use the car. Other companies are working on ways to make cars recognize passengers’ digital profiles and become more responsive to their needs. That might involve things such as reminding someone that a calendar appointment is coming up, and nudging them to leave earlier that day, or giving advice on places to eat along their route or ways to shop online while in traffic. Zoox, a startup valued at more than $1.5 billion, is working on designing a robot taxi that takes the entire riding experience into consideration, co-founder Timothy Kentley-Klay said last year. Existing industries may change to support an autonomous, shared future. For instance, the alcohol industry might see a rise in drinks consumed weekly with customers not having to worry about driving home, says a Morgan Stanley report by analyst Adam Jonas. He estimates the $1.5 trillion annual market might expand by $250 billion due to autonomous vehicles. One industry that knows cars very well—dealerships—may also adjust to fit the changing times: Managing autonomous car fleets may be a new line of business. Toyota’s Mr. Ballinger noted that auto makers’ finance arms largely finance local franchise dealers’ inventories, called floor plans. “It may be a variation of that model where we continue to finance the floor plan, only the floor plan now isn’t an inventory of cars ready for sale but an inventory of cars going around providing services—maintained and managed by the dealer or somebody like the dealer,” Mr. Ballinger says. For all the speculation about big changes on the way, and plans to meet those changes, it’s important to remember that drivers may want to hang onto some form of ownership even if others are more convenient and cost-effective. Mr. Cohen, after spending about two years renting out his Model S on Turo, has begun to wind down that effort.